I know it’s a bit late to be posting a recipe you would normally associate with Christmas but I’m going to be making these all year round so I thought I’d share the recipe. I’m not a huge fan of traditional mince pies unless they are completely drowning in custard, so I decided to try and make a pie which had the custard inside ready. I had a few very messy attempts before realising it just doesn’t work as a pie. You can’t fill them deep enough with oozing custard. And then they leak and look a mess. Not good enough. I found THIS RECIPE but didn’t fancy using puff pastry. I figured a shortcrust pastry would hold the filling better and then decided to try my favourite sweet pastry instead. I baked them in a muffin tin rather than a bun tray as it needs the deeper sides to hold it all together. This recipe makes about 18 tarts. I take no credit for the filling as it was originally thought up by the previous recipe writer. 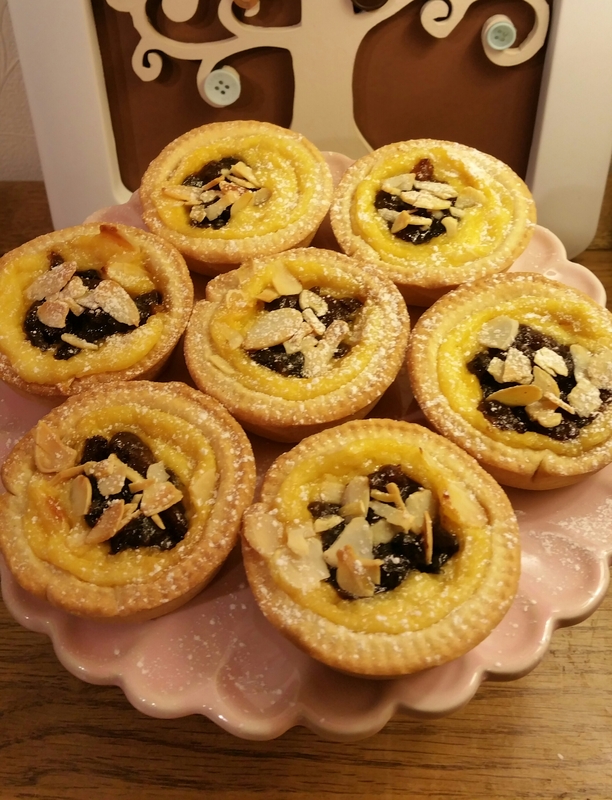 My son doesn’t like mincemeat but wanted some custard tarts too. 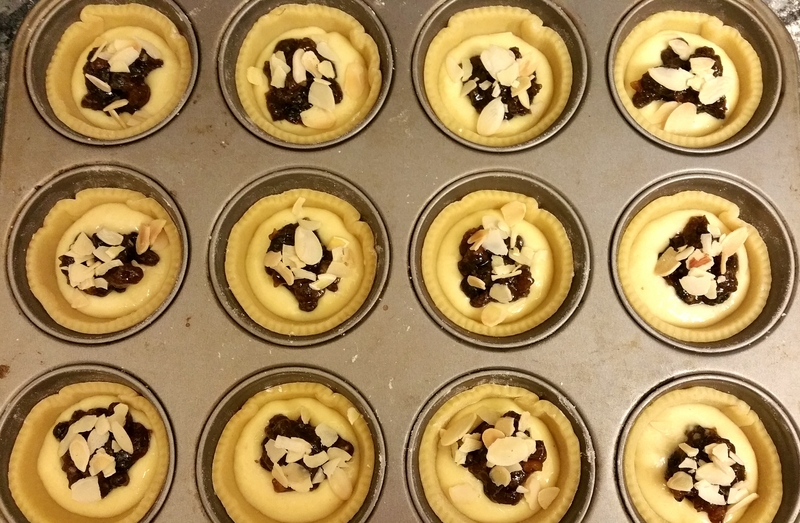 I substituted the mincemeat for jam and they came out beautifully. He ate 2 of his jam and custard tarts as soon as they were cool enough and has asked if I will make these all the time! Rub the butter into the flour until it resembles bread crumbs. Stir in the sugar. Pour in the beaten egg and use a round bladed metal knife to mix it in as best as you can. Use your hand to press any dry bits into the pastry mixture. Press it all together until it is a smooth ball. It will feel very slightly sticky. Wrap it in foil or clingfilm and chill in the fridge for 30 minutes. While the pastry is chilling, preheat the oven to 180C. Very lightly grease a muffin tin with butter. Mix the custard and the ground almonds together. Remove the pastry from the fridge and gently knead it to soften it to a rollable consistency. Dust your work surface with flour and roll the pastry to your preferred thickness. Mine was about 4mm. Use a large round cutter to cut out circles. Gently press the pastry circles into the muffin tin holes. 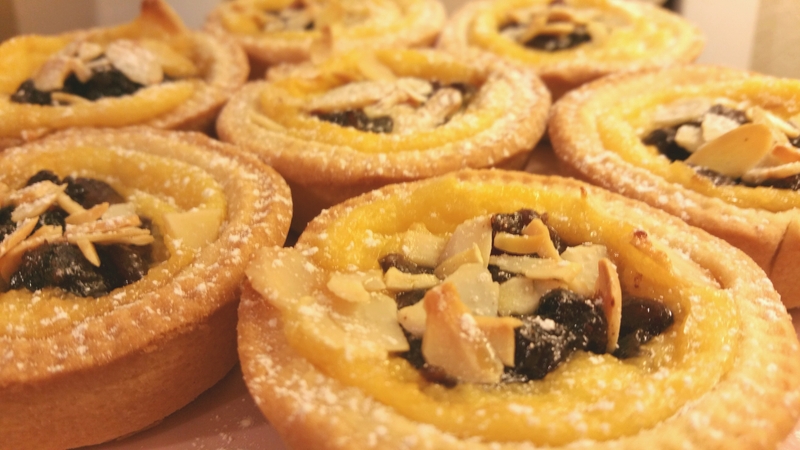 Add 1 heaped teaspoon of custard mixture to each tart, and then add 1 teaspoon of mincemeat in the middle. Sprinkle over a few flaked almonds and then bake in the centre of the oven for around 15-20 minutes until the pastry is lightly golden. Leave to cool in the tin for a few minutes, then gently remove using a small spatula or knife. Dust with icing sugar and serve warm or cold. As you can see from my picture below, my largest pastry cutter only cut circles big enough to go halfway up the sides of the tin. If yours goes higher you can add more filling.